This ski area went through several names and nicknames. It was founded sometime near 1940, as a listing the Massachusetts Paradise for Winter Sports brochure mentions this area as Sheldon Hill, with two rope tows. The ski area was one of the first to offer night skiing in the early 1940's. Later, the area was referred to as the Leominster Ski Area and Cliff's Cliff, according to Bob Johnson. Owned and operated by Cliff Healy, the ski area was later owned by Cliff's son Ken who renamed it Pheasant Run in 1966. It was billed as a "new" ski area that year in the Boston Globe, but was likely more just a relaunch by Ken. It originally had rope tows, but gradually expanded to include 2 T-bars, one in 1967 and the other in 1971. The vertical of Pheasant Run was 230'. According to Brian O'Malley, one of the neat events they offered was Florida Night, where if you brought an orange, you could for $2.00 on Tuesday nights in 1978! By 1980 the area had probably closed, and in the late 1990's the entire area was developed for housing. Here's an ad from the Eatern Ski Map in 1969. Here's an ad from 1969-1970 that shows the trail map. Fairly similar in size to Nashoba Valley at the time. Thanks to Dave Hilton who provided this to NELSAP! 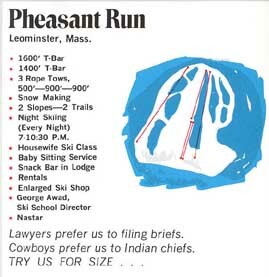 A mid 1970's brochure courtesy of the New England Ski Museum. Here's a good trail map of the ski area. Notice the series of rope tows in the center and the two T-bars on either side. Perhaps the funniest thing here is the saying about the lawyers and cowboys...interesting, huh? 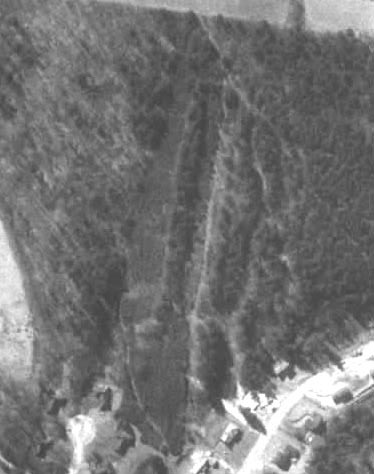 This 1995 aerial image is courtesy Terraserver and shows the ski area just before the housing development took off. . Notice how the trails had grown in somewhat. There were two wide slopes on the left, and a series of slender squiggles on the right. This video from "georgef551" gives a tour of the housing development and the former ski area. My mom and I went to visit Pheasant Run in early February. Similar to some other areas, like Hidden Valley in Ashburnham, Pheasant Run has been developed as a housing project. Can you guess the name? If you guessed "Pheasant Run", you guessed right. The only trace we could find of a ski area was a lift line that was about 100 feet long (picture coming soon) and grown in trails behind people's home. Possibly an old parking lot too. Interestingly enough, one of our NELSAP readers, Brian McBride lives on this ski area! 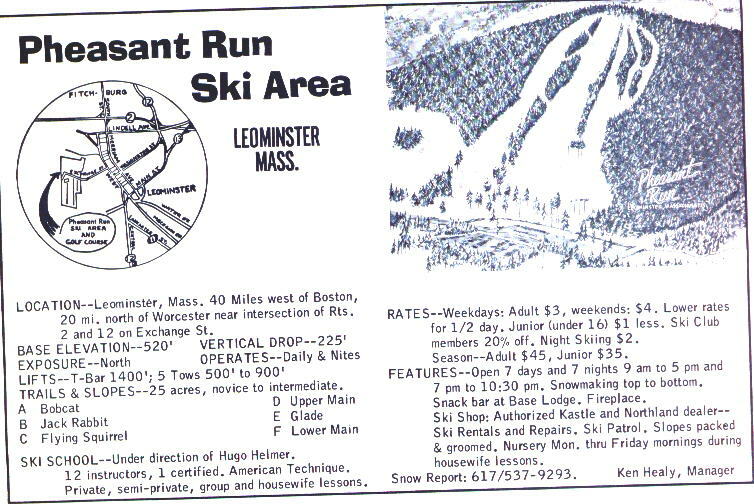 Bob Johnson: Info on your page indicates it operated from 1960 and was originally called the Leominster (Ski Tow?). Anyway, I don’t believe it was ever a municipal area. It was owned and operated by Cliff Healy as early as the late 1930’s and was known then as Cliff’s Cliff. That may have been slang and perhaps it was the Leominster Ski Tow then. My mother skied there at that time and only remembers it as Cliff’s Cliff. Cliff’s son, Ken Healy renamed it Pheasant Run in the 60s and owned and operated it until it closed. Also in the 60s there was an Austrian Ski Instructor named Hugo Helmer who ran the ski school…and owned the first pair of Raichle Red Hots! I believe he latter ran the Ski School at the Brookline Ski area in Brookline NH. John Mercier: I lived about ¼ mile down Exchange street from Pheasant Run ski area during the mid to late 50’s, at the time we just called the area Leominster Ski Area. It was run by a man, I (believe his name was Cliff Healy) that owned the property and had a old farm on Granite street. They had two Rope tows, one on the lower half hill and one for the top of the hill. Most of the time only the lower tow was open. There was one main open slope from top to bottom and one trail through the woods on each side of the main slope As a young kid I learned to ski on this hill and at times even got to ski free by hauling up cans of gas well on the rope tow , or a bunch of us would pack the hill by side stepping from bottom to top after a fresh snow. There was no snow making and the area depended totally on natural snowfall. From about 10 years old to 14 or 15 a basically lived on the hill in the winter time. Occasionally after a good rain storm, in the summer, we would ski on the pine needles in the woods between the main slope and the lower trail. I also used to hunt pheasant with my dad there in the fall. Richards Dairy Farm on Elm street was adjacent to the ski area and as I remember they grazed their cows on the hill each fall keeping the grass on the hill short. They also held sanctioned motorcycle hill climbs and races on the hill once in awhile during the summer months. These drew a much larger crowds than the had skiers in the winter. I left the Leominster area in 1964 and wasn’t there when the area got all fancy. It was just a real nice place for kids and families to go spend the day for very little cost. Laurie Puliafico: I skied there a couple times when my sister was in college at Becker. They took their students there rather than going to Wachusett, which at the time was a t-bar area also, and more expensive. I remember going there one Tuesday night in early spring with her and seeing people in shorts and bikini tops (on the girls). I believe that was in 1979 because I had my license and a car and met her there. I skied all over Central Mass in the late sixties and early seventies competing and racing for Pheasant Run. In the late 60's and until 71 I worked at Pheasant Run and was the Nastar Pacesetter when Nastar was just starting. I also won the first and only Professional Race held there in 1971. I left the area in 72 and have worked at Killington and Okemo ever since. Pheasant Run was a great area, it was a place where many young people for the area skied and fell in love with the sport. During vacation weeks at Christmas and in February hundreds of kids would learn to ski as part of the Leominster Recreation Program. It was always busy and I guess in the end the energy crunch got to it. I have great memories of skiing at Pheasant Run every night and always credit my start at Pheasant Run with my career in Skiing. I went on to be Director of Racing at both Okemo and Killington and although now more involved in golf than skiing I still work for Okemo Resort. Hal Baker: I remember this slope as the one that my friends and I raced straight down with no attempt at turning. Energy crisis and no snow killed it. Lorrie Langille: I grew up in Marlboro, MA and when the ski lessons run by the town's Recreation Department outgrew the hill on the first hole of the country club (where you had to walk up, carrying your own skies), they chose Pheasant Run (around 1970). There was a small ski area in Marlboro, Jericho, that was much smaller, steeper, and only operated two difficult rope tows - not an ideal beginner area. If memory serves, it cost $2 for the bus ride back and forth to Leominster, a morning lift ticket, and 2 45-minute lessons. The main lift at Pheasant Run was a T-bar that went either half-way up or all the way. The top section was much steeper (to a beginner) than the bottom and the group lessons were pretty good. Even with several bus loads of skiers on two main slopes, I rarely remember it being crowded or standing in a lift line. I do, however, remember that they had great hot chocolate and a DJ that played in the very small cafeteria after the morning's skiing had ended and before the bus ride home in the afternoon. 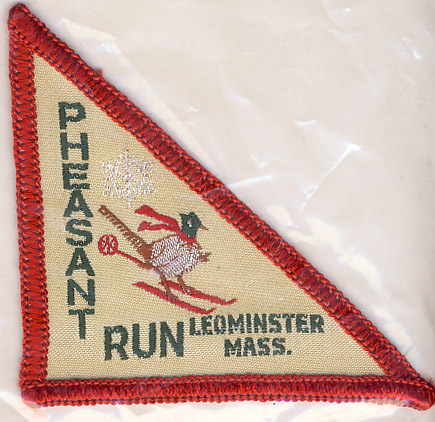 Peter Watson: Pheasant Run in Leominster was started shortly after WWII, like so many places, by at least one or more persons from the 10th Mountain Division, including a somewhat distant cousin, Billy Sullivan. My mother talked of his having helped cut in the trails. It had two levels and we younger kids got off at the lower, flatter one. I believe that you could ski only the top T-bar if you wanted and certainly could get off halfway. The top half, which I never skied as a kid, looms in memory as steep but that's entirely relative. There was a warming hut and I remember there being a brook running along the bottom of the lower slope. We always worried that if we didn't stop in time we'd go into the brook. In the last 10 years or so I drove up into that area and couldn't tell where it had been. There are houses there now and it doesn't look all that steep at all. Marc Di Geronimo: It consisted of a rope tow and a T-bar had two trails on either side of the T-bar one had a bit more of a pitch at the top than the other. Don't know if it is the kind of place you are looking for but it was where I first learned how and I have some great memories of the place. Brian McBride: The developer of the housing development is Bovenzi Inc. but was originally laid out by Ken Healy who is also the manager of record on the brochure you have on the NELSAP site. I think the area was planned to be a development from an early point as many older maps show roads going up the hill. BTW, the hill the area is on is called Sheldon Hill and the back side is an historic farm which is being renovated. The plan is to develop the back side of the hill as well with an outside chance it will be set aside as an agricultural preservation area. Much of the land falls into a watershed protection zone and will not be developed. This is good for us as that land is directly behind our house and the woods will stay intact. There was also a golf course in the area of development at the bottom of the hill. I moved to the area in 1981 and it was closed by that time.